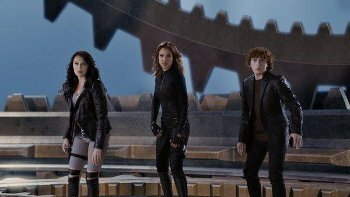 After eight years off the spy set, Daryl Sabara reprised his role as Juni Cortez for Spy Kids: All the Time in the World 4D. SK4 features more action and fun than ever, not to mention a couple new faces, like Jessica Alba. Find out more about how this 19-year-old actor feels about getting back in the spy game in his Kidzworld Q&A! Daryl: Actually I had a really random start, I was like seven weeks old and I have twin brother and my twin and I were in Murphy Brown, a really old show, as Murphy Brown’s baby. But then I was about I think three when I really started bugging my mom that I wanted to do it, I just loved watching TV and I wanted to be an everyday TV boy, so I took some classes and did a couple things when I was younger, and when I was seven I landed Spy Kids and things kind of took off from there. KW: How is the latest Spy Kids movie different from the rest? Daryl: Well I think Robert kind of ups the ante every film, so I think there’s more fun and gadget and action and then there’s a whole new dimension in this one, which is crazy! It’s a fun ride you know, people will have a lot of fun watching it. KW: What’s your favorite on-set moment from SK4? Daryl: Honestly my first scene, when I got back to Austin, I was on this stage that I hadn’t been on in a really long time, playing this character I haven’t played in eight years, it was really nostalgic. You know, the double doors open and there’s wind in my hair and it was really funny and exciting. KW: What was it like to work with Jessica Alba? Daryl: That’s my second time working with Jessica; we were in the film Machete together, and we actually found out while filming Machete that she was going to be in Spy Kids 4. So it was cool to have her come be part of the Spy Kids world, and it was fantastic to see her play a mom, she’s such a great mom. KW: Do feel like you are similar to your character or not? Daryl: That was like the first thing about doing this film, you know when I did Spy Kids 1,2 and 3. I was seven, nine and 10, and they were my first movies. Honestly I was just being myself, I was just being a kid, and so when I heard that I was doing Spy Kids 4 I watched the other films again so I could see what I did and to see how I could bring it back to life. Now I’ve been acting more in between Spy Kids 3 and Spy Kids 4 and I wanted to bring that character back to life and have the same mannerisms. Daryl: Oh wow. I don’t even know where to begin. Ryan Gosling is awesome, I’ve watched all of his films and he has made some really cool moves. I’ve always been a huge Johnny Depp fan, he’s a really great character actor. Phillip Seymour Hoffman, and Dustin Hoffman, all those Hoffmans. Tom Hanks, the list goes on and on. KW: What is your favorite film or TV series you’ve been in so far? Daryl: I have a film coming out called John Carter which comes out in March, and those are books - Edgar Rice Burroughs is the author of those books - and I read them when I was younger. Now I’m a part of the film which is so exciting. That’s what I’m most excited about right now. TV shows, I was in an episode of FRIENDS and I am a huge fan of FRIENDS, and I got to be in the last season, it was so much fun. Also I was on an episode of House, and I love House. KW: What kinds of roles are looking for now? Daryl: I think doing something super action-y would be really fun, but I love all kind of movies. I just kind of want to play fun characters, doing a comedy or a really serious drama, I just love it all. KW: What is the best piece of advice you’ve received since becoming an actor? Daryl: Honestly just to be free. I got to work with Robin Williams on this film called World’s Greatest Dad and watching him was the greatest acting lesson I could have gotten, and he just taught me to be more free and be in the moment. Daryl: Probably that I play the piano and guitar and I’m a huge Coldplay fan. The new album is so good! Check the trailer for Spy Kids: All the Time in the World 4D here! What did you think of Spy Kids: All the Time in the World? Let us know in the comments section below!